Government Law College, Thrissur is hosting 11th All India Moot Court Competition for Justice T. Ramachandran Memorial Ever Rolling Trophy from 1st March to 3rd March 2019. Venue: Government Law College, Ayyanthole, Thrissur, Kerala. 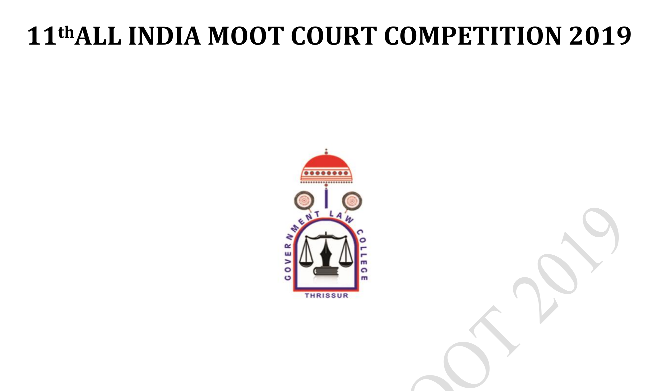 Provisional Registration of the teams for the competition shall be done by sending email to glctcrmoot2019@gmail.com on or before 25th January 2019. Upon receipt of confirmation from us, please send duly filled Proforma for Registration along with a fee of Rs. 3000/- by way of bank transfer/NEFT on or before 28th January 2019.